An impressive dual of the famed SOCOM pistols. This special bundle includes 2 full sized and 1:1 scale "hand cannons." 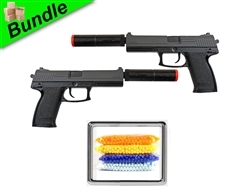 These large caliber replicas are finely crafted including a working double-action hammer and functional safety switches. Operated manually by a pull of the slide to arm the gun for each shot, these mega pistols fire at 270 FPS and includes a attachable mock suppressor unit to fill out the full tactical package. Also included is an additional bonus 5000 rounds of quality 0.12g BBs so the fun never has to end.